at the Ricoh Arena, Coventry. The IOV Awards cover six key areas of video production, namely Best Corporate, Best Wedding Day Film, Best Documentary, Best Film, Best Music Video and Best Open - and are freely open to all IOV members. In addition, a new award was introduced this year for Best Overall Production. 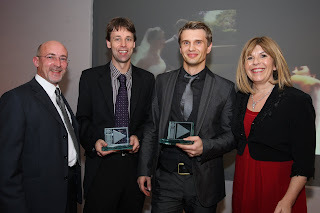 Lenik Wedding Films of Leeds won the 'Highly Commended Award' in the Open category against extremely tough competition. With over 1,000 members throughout Europe, the IOV Awards has fast become the leading showcase of talent in professional videography and attracts sponsorship from the leading manufacturers and suppliers to the industry. Presented by former Tomorrow’s World star, Maggie Philbin, the Oscar-style ceremony took place alongside the IOV’s Annual Convention held in the Jaguar Halls at the Ricoh Arena,Coventry. Almost all the short-listed entrants were in attendance, and as the final running order is not announced until the night it creates a wonderfully exciting atmosphere for all participants. Here is the video that won our award!